Your toddler is quietly coloring by himself in the living room so you decide to seize the opportunity and sneak away for a few minutes to finish your now cold lunch that has been sitting on the counter for over an hour. Your rainbow-colored child appears very proud of his handy work, however, you’re not impressed. “No TV for a week!” you proclaim as you run over to him. Immediately after those words fly out of your mouth in frustration, you regret it. You realize that not only was it a totally unrealistic consequence, but it will end up hurting YOU more than it will him. We all need a little Daniel Tiger to save our sanity some days! Little Johnny had been pushing your buttons and testing your patience ALL MORNING and you had just officially hit your limit. That was the last straw. In the heat of the moment, it’s easy for your discipline plan to fly right out the window. Your mind totally blanks as you anxiously search for an effective consequence. The type of consequence we are going to talk about falls within the “Logical Consequence” category. A Logical Consequence is one that is engineered by the adult and is related to the behavior. When a consequence is given that is NOT related to the behavior, it fails to make a connection for your toddler and the “lesson” is lost. This differs from a Natural Consequence which is something that you sit back and allow the child to face without any adult intervention. A Logical Consequence is used when a Natural Consequence isn’t practical, safe, or doesn’t make sense. When a child is behaving in a way that frustrates you and you want it to stop, then a Natural Consequence just wouldn’t make sense. The repetitive, annoying behavior is what leads you to that boiling point and need for a quick fix. An adult must intervene in this type of situation. Whether your child is throwing his toys, coloring all over his body, or carelessly tossing couch pillows near your 5-month-old baby, this go-to formula will come in handy! When your brain shuts down from frustration, just remember these words: Either-Or. The Desired Behavior: What do you want your child to do? The Undesired Outcome: What will happen if he doesn’t do that? Either you DESIRED BEHAVIOR, or UNDESIRED OUTCOME. Pro Tip: For the desired behavior, tell your child what you want him TO DO instead of what you want him to STOP DOING. This type of language is more concrete and clear for toddlers. So instead of saying “stop coloring on your body with the markers”, you’d say “use your markers to color on the paper”. Once you have given the Either-Or statement, be prepared to follow through IMMEDIATELY if they choose to keep doing the undesired behavior. But then my kid is going to freak out and have an epic tantrum! Yep. They probably will. And that’s okay! Let your child get out his angry feelings as long as the people and things around him are safe. It will take a little while for your child to adjust to this new way of learning and discipline. Need some further help handling the tantrums? 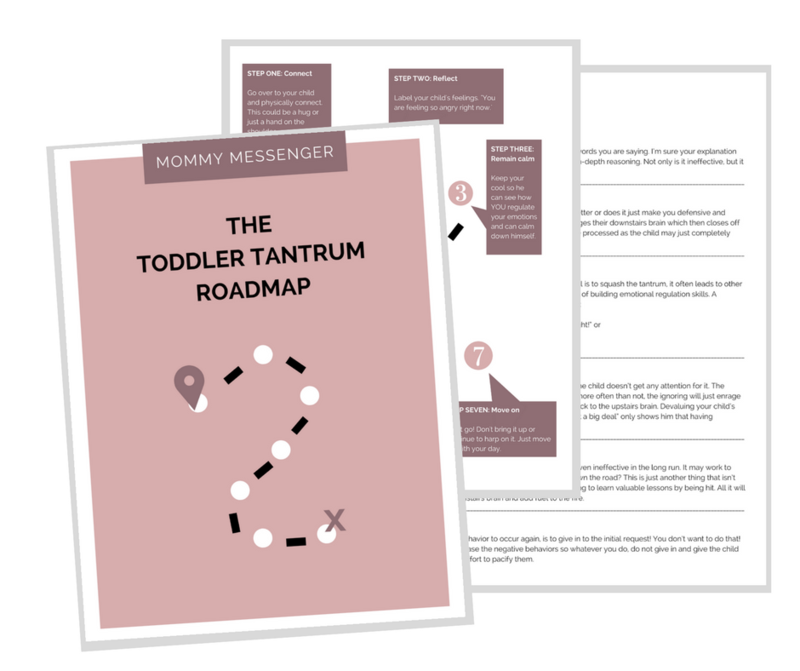 Download this Toddler Tantrum Roadmap and prepare yourself! Snag your Toddler Tantrum Roadmap! Success! Now check your email (Inbox AND Promotions) to confirm your subscription and download your roadmap! throwing toys Either you play with your toys nicely, or they will get taken away for the rest of the afternoon. touching/hitting Either you touch your friend nicely, or I’ll have to move you somewhere else. throwing food Either you keep your food on your plate, or you’ll have to pick it up and dinnertime is over. getting up from the table Either you stay sitting at the table, or I’ll have to put you in the highchair. using object inappropriately Either you use that (insert object) the right way, or it will be taken away. running away in public Either you walk close to me, or you’ll have to ride in the cart for the rest of the trip. ripping pages in a book Either you turn those pages gently, or the book will be taken away. whining for object Either you use your big boy voice, or you will not get the (insert object). jumping on the couch Either you sit on the couch while I cook dinner, or you’ll have to go sit in the playard. pulling your hair Either you touch my hair gently, or I will put you down (if he was being held). Decreases the likelihood of doling out an unrealistic/unrelated consequence. Helps your child connect his actions to the appropriate consequence, thus teaching him a lesson. Gives your child choices and the opportunity to comply. Allows you to remain consistent with your discipline tactics, which helps your toddler learn his boundaries. The concept of cause and effect isn’t truly understood until a child is around 2.5 years old. Before that age, they can’t make the connections between their behavior and the consequence. Therefore the lesson will be lost on them. If your child is younger than 2.5 year of age, then try some other tools such as Natural Consequences, Ignoring, Immediate Follow Through, or Redirection. Don’t set your young child up for failure. Wait until he’s developmentally capable of understanding the concept. The Either-Or statement alone will yield good results, but those results can improve exponentially with just a few additions. If you are trying to dish out the consequence from across the room, then don’t be surprised if the behavior continues. It is important to gain your child’s full focus and attention so you know he heard everything and understands that you mean business. Walk over to your child, get down at his eye level (or slightly below), and give your Either-Or consequence. A common problem I see is that parents wait too long to give the Either-Or consequence. They let the behavior continue to annoy them until they get to their breaking point. If you’re extremely annoyed and frustrated by your child’s behavior, then you’ve let it go on for too long. As soon as you see the behavior start happening, go over quickly but calmly, and give the consequence. Always, always, always follow through with your Undesired Outcome right away. Do not give more chances! Your toddler’s behavior (and your sanity) can be transformed using the Either-Or Consequence consistently. Need help coming up with an Either-Or statement for a unique behavior? Post it in the comments and I will help you out! Hi. Good idea. I like the concept. One of my biggest struggles is a toddler who won’t sit so I can strap him in the car seat. It is a physical battle every time. He isn’t motivated to comply if I say either you sit or we won’t leave. Any suggestions? Also dumping water that he finds like dog water or an open cup someone leaves on the table. Thoughts? Thanks. As for the dumping water, try to prevent as much as possible by not leaving those things out (I’m sure you already try to do that) but when it does happen, have him clean it up (with your help). Remain super chill about it. Then maybe redirect (not necessarily at that exact time) to an acceptable water activity like a water table, sprinkler, bathtime, etc. Not exactly sure the context of his dumping the water or why he’s doing it but maybe he just likes to play with water! So show him acceptable ways to play with water. If you’re not going to follow through the behavior will continue. So take her in whatever she has on. Bring the other clothes with have her dress in the car after you get where you are going. Or take her in as she is You are in charge not the kid be a parent not her friend. Taking clothes and diaper/pullup off at nap and bedtime. Then she end up wetting her sheets. My daughter is 2.5. Hi Brittany! Can she verbalize why she’s doing that? Maybe ready to potty train (doesn’t like the feel of the diaper anymore)? I have 6 toddlers climbing on our table at school, I say make your feet safe or I will help you, doesn’t work one does it they all do it. I have reminded them about how the monkeys jumping on the bed bumped their head, and ask do you want to bump your head? I really believe it’s the attention they get. We give them lots of one on one attention but they still choose to do this. I have talked to them about how we eat at this table, we don’t want our feet on the table. I have a pitcher posted on our rules of our classroom of feet on the floor. I have tried our walk away please statement. We cannot use discipline only redirection, please help. I have talked with parents asked for ideas but they allow it at home they just teach how to climb down. My Director will not allow them to climb on the table. I brought in climbing structure, and we spend a lot of time outside climbing I am lost on what to do. They smile and look at you while they are doing it. I would redirect with nap time. You need to be firm about their behavior is not allowed. Take away another activity. Or have your director run the class at this time. Hi Andrea! It’s definitely a lot tougher when you’re dealing with more than 1 kid. Could you flip the table upside down during the times they’re not using it? Or put something across it so they can’t get on top of it? If it’s a time when they need to be using it, maybe try doing a super fun activity that they all love at the table and reveal in advance that if they choose not to follow the table rules, then they will be moved somewhere else (to work on a boring activity). You’d probably need a few adults including yourself to make that happen and follow through with it. If one of them does climb up, give them the Either-Or statement “Either you keep your feet on the floor, or you’ll be all done with this fun activity.” Only give that statement ONCE. If he does it again, have one of the other adults calmly remove him from the group and go work on something boring. You continue to have a ton of fun with the other kids at the table. Afterwards just give him a quick “I would love for you to join the activity next time.” Hopefully after a few times of being super consistent with removing kids from the activity, they will catch on! If it’s happening during snack time, then I’d end snacktime when they don’t follow the rules. Let them know this ahead of time though. It sounds like you already are doing a lot of pre-teaching so they know exactly what the expectations are but maybe pretend they need to do a fun group project together where you’ll take pictures of them following the table rules (feet on the floor, sitting nicely in chair, etc.) and post them up in the room or show them to the director! Get them really excited about it and really praise their great choices when they do follow the rules. Sorry this is all a jumble I’m just trying to talk this all out lol. This is great, and I’m fine coming up with logical consequences for some behaviours, but one thing I really struggle with is getting my toddler to get dressed. We have the same battle every day, I give her choices of clothes to give her ownership of the task, try the “see if we can get you dressed before I count to 10” game, etc etc but she just lies there face down ignoring me. I get more and more annoyed because we’re late and end up threatening her with something I’m not going to follow through on. I’m 35 weeks pregnant so can’t pick her up without her compliance, and won’t wrestle her into her clothes either. please help!